What is the craziest reason why you’ve been pulled over? Growing up in rural northern NY, I had my share of run ins with the local law enforcement. Probably the funniest encounter (traffic related, at least) happened during my freshman year of college. Here we go. My first vehicle was owned by my dad, but I had full use of it. 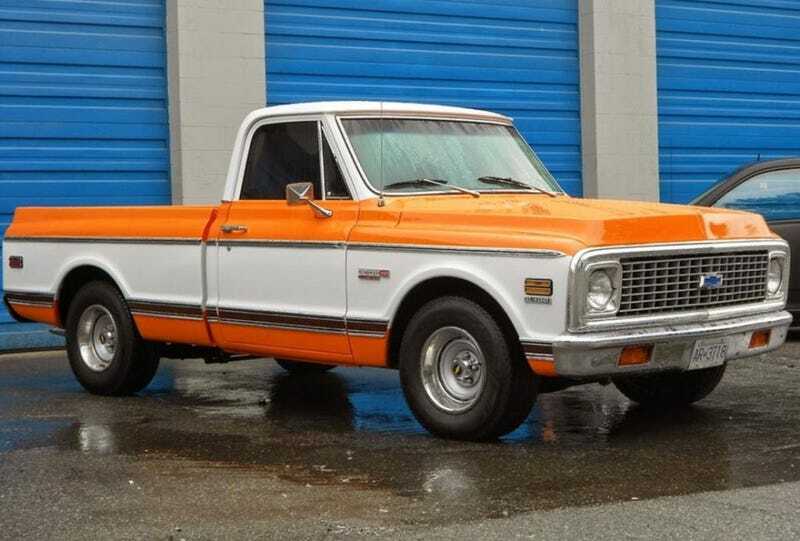 It looked like the C10 pictured, except with 90% more rust, and a truck bed that had painted in mobile home roof paint (very metallic silver) as a form of cheap rust protection. It was an ugly but extremely trusty beast. The 307 with the 3 on the tree never let me down. Rust is what finally did the truck in, the rockers and cab corners were in especially bad shape. I’d routinely stuff towels in the corners behind the seat to prevent getting wet when it rained. One night, three of us were riding around Potsdam, NY in the truck, a light mist falling. We had just gone for pizza and we’re heading to the grocery store for some more late night munchies when I saw the lights blip on behind me. I checked my speed, checked that my lights were on, and had no clue why I was being pulled over. I’d assumed that given the hour, I was probably about to be given a sobriety test. No worries there, either, if that were to happen. But it didn’t. As the officer approached the truck, I could already see a broad smile on his face, which put me at ease. Other traffic stops have not been quite as cordial. As I rolled down the window, he asked if I knew why I had been pulled over. I responded with a polite “No”, when he responded that he thought I had been dragging a person underneath my vehicle. It ended up that night, instead of stuffing towels in that rusted through cab corner, I had stuffed some used disposable paint coveralls. While I was driving, it inflated underneath the truck to the point where it looked like there was a person underneath. At least, according to the cop that’s what it looked like. I sure would’ve liked to have seen a picture.